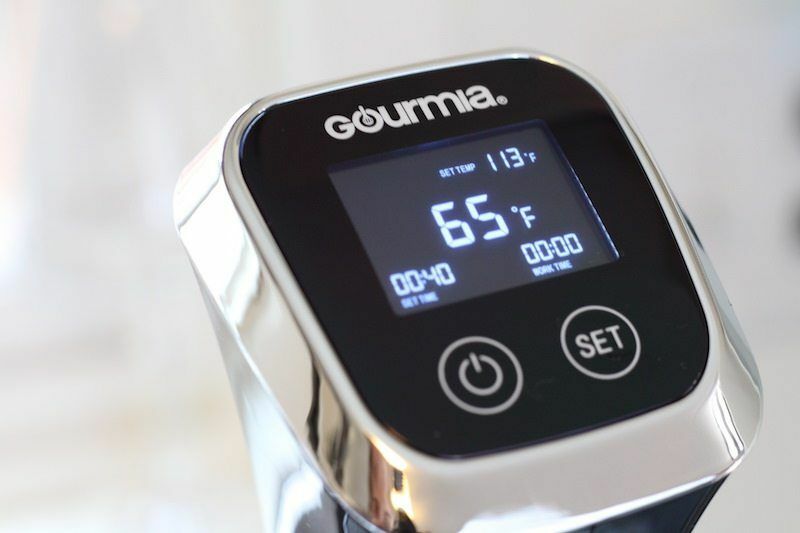 Though prices of home-use immersion circulators range from about $60 to $250, Gourmia products tend to fall in the hundred-dollar range, making them more inexpensive than many other brands. 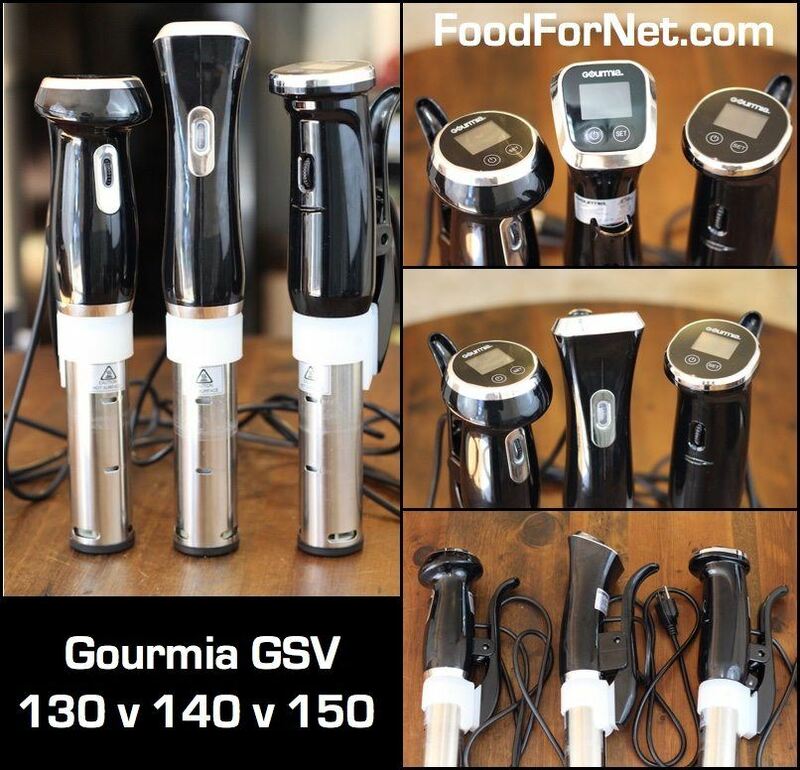 A few months ago I bought and tested three different Gourmia sous vide immersion pods – the GSV130, the GSV140, and the GSV150. They were all slightly different, so I wanted to make a post comparing them so you can decide which one is best for you. The full reviews (linked below) contain pictures, videos, and more details about each individual product. Note: Hover over (click on mobile) the “Get It Here” link for current pricing information. When compared to other immersion circulators, it starts to look like even more of an attractive buy. So the fact that you can get this one at a major discount, usually under a hundred bucks, is quite a deal. There are other, cheaper immersion circulators out there like the AdirChef pod, but they do take longer to get your food started. Once started, they operate pretty much the same, although I will say that in this case, the AdirChef is a lot quieter than Gourmia products. Another cheap alternative* to the GSV130 is the NutriChef Prime, which seems to be manufactured by the same company as Gourmia (or a really good knockoff). It looks very similar, has 1200 watts power, same pump capacity as the 130, and even a similar interface. *Keep in mind that prices fluctuate depending on the seller and availability of each product. The GSV140 immersion pod is actually my favorite of the three generations. One big element in this choice is design. Sure, a pretty appliance won't cook you a better steak, but if it's sitting on your kitchen counter every day it's nice to have something attractive to look at. If the “look factor” came at a huge premium, I could ignore it and just get something practical and cheap like the 130. But it currently costs just about $10 more than the 1st generation pod to have a much sleeker look, so yeah, I'll pay a bit extra to get the style I prefer. Function-wise, it's pretty much the same as the previous generation with the exception of the water pump being stronger. Both the 130 and 150 can move 1.5 gallons of water per minute, while the GSV140 can do 2.1 GPM. When cooking small amounts of food, you probably won't notice a difference. Maybe the smaller pump would be better since it's going to be a bit quieter too. But with 2.1 GPM you can cook food in 10 gallons of water! That means you can cook for whole family, or do a bunch of ribs for a weekend BBQ, or meal prep for a diet. It also costs a bit more. Since the features aren't something I really “need”, to me, it's not worth the extra cost. So the 2nd generation pod from Gourmia is a good middle-ground. I get a device I like, without unnecessary features, for an inexpensive price. Solid! The 3rd generation, and newest edition to the Gourmia family is the GSV150 immersion pod. Though not entirely different in design, it does contain a few new changes that distinguish it from the previous two generations. What's new with the GSV150? Something big actually – it can connect to your smartphone using WiFi. 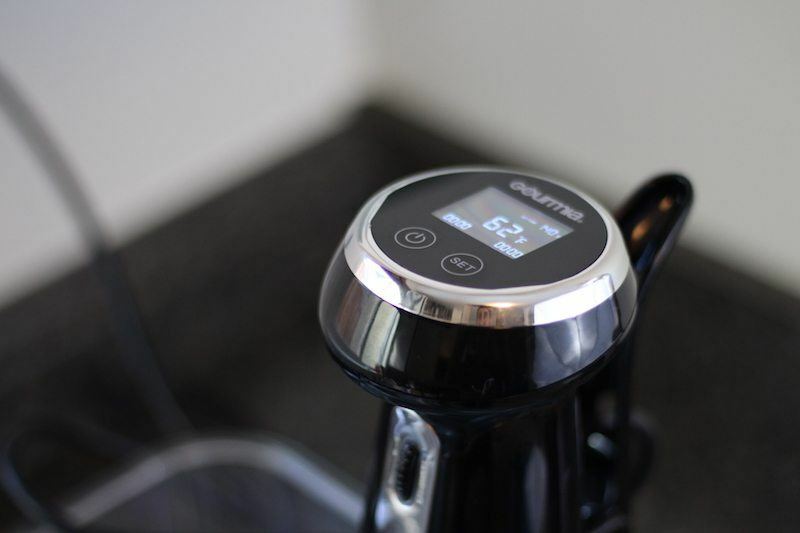 WiFi sous vide devices are popular right now, and all brands that are serious about sous vide are coming out with smartphone-connected, updated versions of their products. We see this with the Joule, Nomiku, Sansaire, and Anova. They do this with varying degrees of success. Unfortunately, Gourmia didn't do so hot on their app in my opinion. It's difficult to navigate, contains quite a few spelling errors, and isn't “beautiful”. Yes, it works, practically speaking. You can use your phone to start, stop, and monitor your cooking. You can also use the Gourmia app to check specific times and temperatures for cooking. But it's not a true “app experience” like ChefSteps provides with their Joule App. Also worth consideration though, is the fact that the GSV150 is the cheapest WiFi-connected immersion circulator by far. 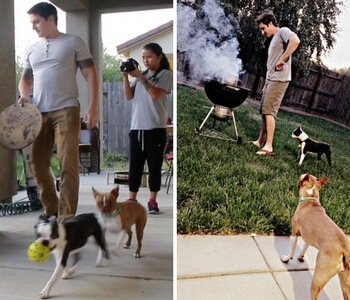 The Nomiku is currently selling for $250, and you can get a Gourmia pod for half that price. So if you want a cheap WiFi-enabled sous vide cooker, then actually, the 150 is your best choice. Gourmia also produces a couple “water ovens” which are relatively inexpensive. I have not purchased and reviewed then yet. I will update this post with a link when I do! However, I think most people would prefer to have a small immersion pod instead of a toaster over or microwave-sized device sitting on their counter! 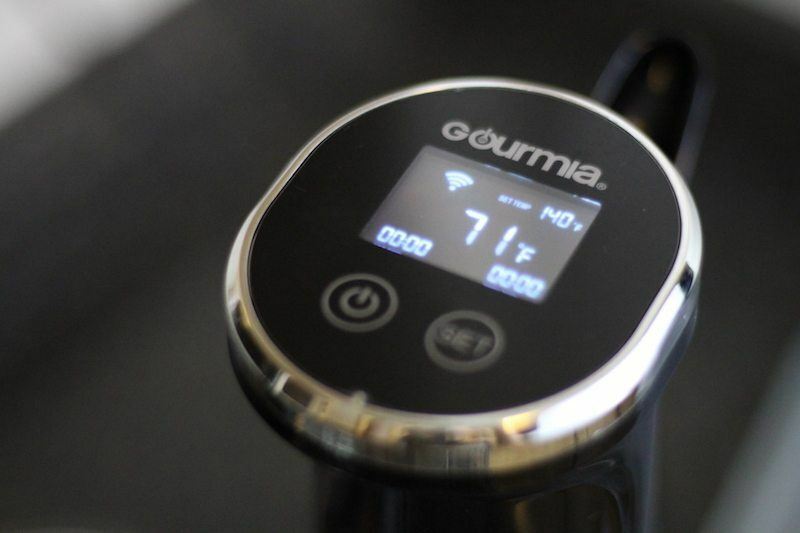 Which Gourmia sous vide circulator do you think you like best? Do you have any questions about other differences I didn't discuss? I own all three, so will be happy to add some comparisons. Leave a comment or question below!